Pizzscotti Trattoria & Bakery Bar! Brunch, Lunch, or Dinner! $20 Worth of Food For $10 For Dinner or $10 Worth of Brunch or Lunch For $5. Wednesday Trivia Night (every Wednesday) 5pm to 9pm Dinner available. Tucked away in the Simi Valley Town Center just behind Jamba Juice is the adorable, delicious Pizzscotti Trattoria & Bakery Bar! Summer and I stopped by for lunch and were immediately impressed by this eat indoor or outdoor trattoria. Salads were large and fresh and the paninis were cooked just right. And there is something for everyone! Salads range from a classic Chopped Italian to a Summer Salad with pecans, blue cheese, and sliced strawberries to a unique Cranberry Chicken with chicken, mozzarella cheese, and cranberries. 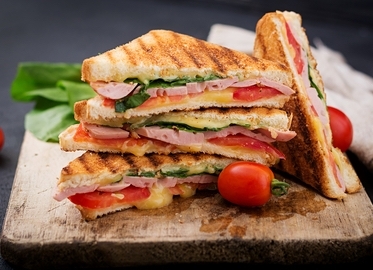 Paninis, served with choice of salad or fries, include a great Veggie Panini, Club Panini with chicken breast and bacon, the “Little Italy” with sausage, ricotta and marinara, and even a panini packed with shrimp! Let’s move on to dinner shall we? Try their famous Polpette, a delicious homemade meatball appetizer, or Italian classics like Chicken Parm, Fettucini Alfredo, Shrimp Scampi, and Stacked Eggplant! And if you’re a breakfast person like me, you won’t want to miss their brunch served on Fridays, Saturdays, and Sundays! I was so wrapped up in Pizzscotti’s menu, I almost forgot to mention our deal! Get $10 worth of brunch or lunch for two or more for just $5 or $20 worth of dinner for two or more for just $10!